Grant Ryan, 29, of Bancroft Drive, Haywards Heath, was fined £440, with £48.34 vehicle excise back duty, and £90 costs. He had been convicted in his absence of keeping an unlicensed vehicle on a public road in Haywards Heath. David Row, 49, of Curtis Way, Kesgrave, was fined £360, with a £36 victim surcharge, £85 costs, and five penalty points added to his licence. He had pleaded guilty to driving without due care and attention at Haywards Heath. Joshua Starns, 23, of Burchetts Close, Haywards Heath, was jailed for 20 weeks, with an £80 victim surcharge, and £620 costs. He had pleaded guilty to common assault, causing criminal damage, and resisting a police officer, all in Crawley. Julie Green, 53, of Slaugham Lane, Warninglid, was fined £55, with a £20 victim surcharge, £85 costs, and three penalty points added to her licence. She had pleaded guilty to speeding. Wayne Levings, 53, of Listers, Warninglid, was fined £100, with a £20 victim surcharge, £85 costs, and three penalty points added to his licence. He had pleaded guilty to speeding at Bolney. Kay Parker-Hinder, 55, of High Trees, Haywards Heath, was fined £100, with a £20 victim surcharge, £85 costs, and three penalty points added to her licence. She had pleaded guilty to speeding. Denise Stacey, 37, of Silver Birches, Haywards Heath, was fined £140, with a £20 victim surcharge, £85 costs, and three penalty points added to her licence. She had pleaded guilty to speeding at Crawley. Sean Campbell, 40, of Beech Road, Clackton-on-Sea, was given a one year conditional discharge, with a £15 victim surcharge, £85 costs, and ten penalty points added to his licence. He had pleaded guilty to common assault, failing to provide a breath alcohol specimen, and driving without insurance, all in Ardingly. Sonam Chosang, 35, of Copse Close, East Grinstead, was given a six month jail sentence, suspended for two years, with a three month curfew, 150 hours of unpaid work, £500 compensation, an £80 victim surcharge, and £625 costs. He had been found guilty of common assault in East Grinstead. 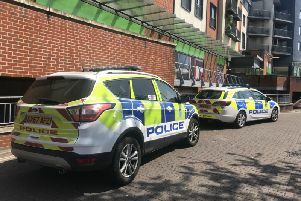 A restraining order was made, barring him from contacting the victim, or going to the Queen Victoria Hospital in East Grinstead except for an emergency.